This Noise Is Ours: Blackened Wisdom - The Angels Are Crying 7"
Renowned bringer of evil black/death/thrash metal Hells Headbangers has put out a slew of vinyl only releases. I've decided to review all six of them fairly close together, for convenience. Also, because I think that's how it should be. Anyway, here's the first. This is a three track 7" from a band called Blackened Wisdom. Blackened Wisdom formed in 1992 in Nebraska, but unfortunately broke up before they had the chance to release this record. This is finally seeing a release now, thanks to Hells Headbangers. 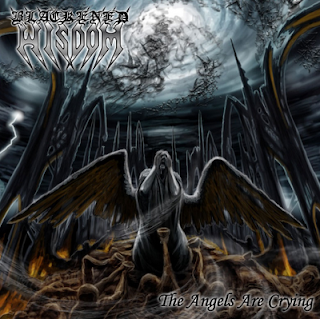 Blackened Wisdom is also special, as the band features members of other esteemed death metal bands. Bill Taylor who plays guitars and does vocals here, has spent time in Immolation, Angelcorpse, Xenomorph and Feldgrau amongst others. Second guitarist Dan Kohler and drummer Mike Gushar are from Laceration. They also feature Rich Sheibal on bass. This is as raw as you'd like it. Its evil blackened death metal at it's best. After Me Comes The Flames is fast, thanks to the drumming and raging guitars and Bill Taylor's vocals are terrifying. This 7" sounds exactly like it should have sounded in 1993. It's worth noting that the tracks here have been lying dormant since they were recorded, so they have not be re-recorded, but just pressed straight onto vinyl and that helps them sound authentic. It takes you back to a time when black/death metal was truly scary. As well the black and death metal influences though, there is an element of thrash in the music, which is no surprise. I, Eternal is a much more mid-paced song. It weighs in at close to three minutes, which is just right, as this is pretty intense. Before you've had time to blink, closing b-side track The Angels Are Crying kicks in with the sound of rain and thunder. Again the intro is mid-paced but heavy as hell and the wailing guitar provides some unheard flair. The guitars are chugging and again, Bill Taylor's high-pitched shriek chills you to the bone. After the extended instrumental section, The Angels Are Crying ends in a flurry of whirlwind blackened thrash. This is low-fi, it's loud and it's exactly as the band intended for it to sound. If you like your old-school death metal tinged with black, you'll love this record. It's a piece of untold history that's finally seen the light of day and needs to be heard. This 7" is not up for full streaming, but you can hear teasers here http://shop-hellsheadbangers.com/EPblackened_wisdom.asp. The above link also takes to you to the Hells Headbangers store, where you can pick up the 7", with the first 100 records being on coloured vinyl and including a lyric insert.